The construction industry is bouncing back in Clark County, but the shortage of skilled labor could pose a problem in completing projects in the future. 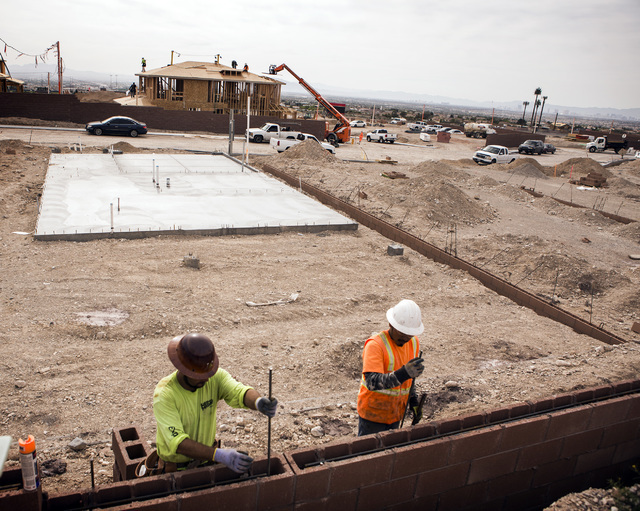 Jeff Scheid/Las Vegas BUSINESS PRESS Construction workers place rebar in a block wall at Richmond American Homes development in Providence May 5. The construction industry peaked in 2006 when it had 110,000 workers, but that fell to a low of 35,000 in early 2012. It has recovered to 57,000 construction workers this year. Drive around Clark County these days and the roads and highways are filled with orange construction cones and detour signs. The Clark County School District has 11 major projects underway, including six new schools and two replacements with a value of $253.3 million. With several resort corridor projects in the works such as Resorts World and Faraday Future starting grading at its planned electric car plant in North Las Vegas, it’s a good time to be a construction company and someone who works for them. No industry was hit harder during the Great Recession when many casino, condo and other projects were either stopped, stalled or scrapped all together. More than 35,000 homes a year were built during the boom and builders hope to build and sell about 8,000 homes this year. The construction industry peaked in 2006 when it had 110,000 workers, but that fell to a low of 35,000 in early 2012. It has recovered to 57,000 construction workers this year, according to Miller. That bounce-back is seen in the percentage of construction employment. In the U.S. between 1990 and 2016, the monthly average was about 5 percent, and it’s currently about 4.5 percent, Miller said. In Clark County, the percentage was around 10 percent from 1990 to the crash, Miller said. It peaked at 11.8 percent in 2006 and then fell to 4.6 percent in 2012. It has since recovered to 6 percent in 2016. That was echoed by John Restrepo, principal of RGC Economics, who said anytime a local economy gets ahead of the national averages, that’s a superheated economy. The lenders, regulators and those in the construction industry are aware of that will keep it from happening, he said. The rebound in the construction industry, however, has come with some consequences, especially for the housing sector. 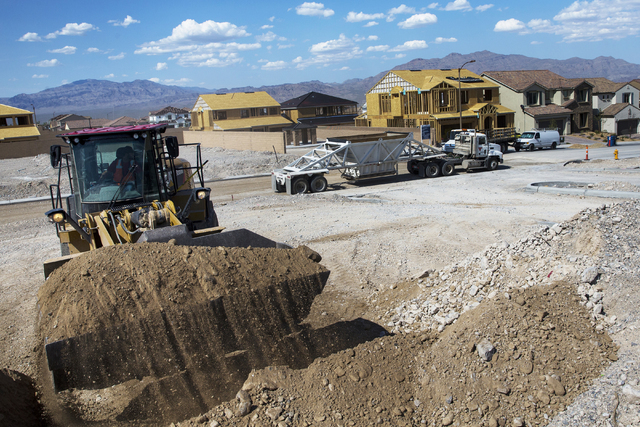 Monica Caruso, director of public affairs for the Southern Nevada Home Builders Association, said there’s a shortage of skilled labor to build homes whether it’s those who frame homes, pour concrete or have other skills. When the housing industry hit bottom in 2008, it probably had an unemployment rate of more than 90 percent, said Caruso, who added it essentially shut down and laid everyone off. Most of those workers left the state or left the industry and aren’t coming back, she said. Rebecca Keenan, executive director of the Nevada Subcontractors Association, said there’s a need for workers in home and commercial construction, but the problem is that workers who went not only to Texas but also to California and Arizona aren’t coming back. There’s a shortage of 1,000 to 3,000 workers, whether it’s plumbers, electricians and other trades, and that’s causing some delays on projects getting done, she said. The association held a job fair in May and has partnered with organizations to find workers, Keenan said. There’s a lot of competition with other industries because they’re hiring as well as the economy continues to improve. The education system pushes people to go to college but those who don’t want to go that route should consider the trades, she said. There are many construction jobs that can pay $40 to $50 an hour and skilled trades workers who earn as much as $70,000 to $100,000 a year, said Sean Stewart, chief executive officer of the Nevada Contractors Association. Much of the commercial work is in the public sector but when the private sector ramps up with several projects along the Strip corridor, the construction industry needs to be ready, Stewart said. That includes the Monte Carlo at the end of 2016 and the next project by Wynn Resorts, he said. There may be a need for 2,000 to 3,000 construction workers on resort corridor projects in 2017 in addition to road work, he said. “We’re working with (the Nevada Department of Transportation, Regional Transportation Commission), UNLV and community colleges to figure out how we’re going to build these projects going forward,” Stewart said. The impact on construction spending is noteworthy, Restrepo said. The $253.3 million in spending by the Clark County School District is expected to generate about 1,087 full-time construction jobs and more than $73 million in income for those workers, he said. When factoring in vendors for those projects that include everything from nails to concrete, that’s 395 jobs with an income of $23.5 million, he said.